Now in its 71st year, the prestigious Los Angeles International Wine & Spirits Competition sees nearly 4,000 wines and spirits from around the globe come through its doors. The competition also serves as the foundation for a wine education program available to visitors of the annual LA County Fair, taking place Sep. 4 – Oct. 3, 2010. Shortly after the repeal of Prohibition, the LA County Fair began awarding medals to the best of California wines. The competition began attracting wines from North and South America, Italy, and in 2002, expanded its entries to wines from around the world. The Extra Virgin Olive Oil competition was introduced in 2000, with California and Spain emerging as last year’s big winners. The 2009 Spirits award winners, including Glenmorangie, named Best of Show. The Spirits Category was added in 2007, including renowned entries such as last year’s Best of Show, Glenmorangie Quinta Ruban (Whisk[e]y Single Malt Scotch 11-20 years old). 2008 saw the premiere of the Wine World of Sports, featuring sports dignitaries-turned-winemakers such as Tommy Lasorda, Mario Andretti and Greg Norman. And last year was the debut of Music Uncorked, a special category for musicians-turned-winemakers. The public will have its first opportunity to taste the award-winners at Wine & Cars Under the Stars, a summer gala that benefits the educational programs of the The Learning Centers at Fairplex. A complete list of all the winners will be available at the official competition website. WIN A GIFT BAG FEATURING THIS YEAR’S SPIRITS AND EVOO ENTRIES! Before they are announced publicly on June 19th, the winners of the 2010 Los Angeles Wine & Spirits Competition will be previewed on Thursday, June 10 at an exclusive tasting event. 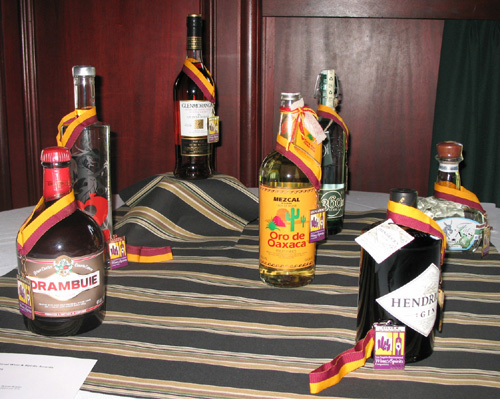 Attendees will receive a gift bag featuring samples of some of the spirits and olive oil entries. Last year’s goodies included Buffalo Trace Bourbon, Hendrick’s Gin, and 360 Vodka. Now, thanks to the generous folks at the competition, one of you lucky readers can win a gift bag and sample some of the world-class competition entries! And they’re even throwing in shipping, so you don’t have to go somewhere to claim the prize, the prize comes to you. How cool is that? To enter, all you have to do is leave a comment with your favorite thing about the LA County Fair. It can be anything: the food, the beer garden, the rides, the pig races; it’s up to you! And if you’ve never been, then tell me what you’re really looking forward to seeing at the LA County Fair if you win. Must be a Southern California resident, 21 or over to enter. Comment must be submitted by 5pm on Thursday, June 10. Once all the entries are in, the Randomizer will pick a name and I’ll announce the winner on Friday, June 11. That’s it, so get those comments in and good luck! UPDATE 6/11: The contest is now closed! Congratulations to our winner, Lisa Starks! Thanks to everyone for entering and leaving your comments. Stay tuned for the list of winners from the Wine & Spirits Competition. UPDATE 6/17: Since our winner never claimed her prize, the gift bag goes to our runner-up, Hemang!